So, if they [i.e. non-muslims] say: ‘Assalaamu alaykum [i.e. peace be upon you]’, we say clearly ‘Alaykumus salaam’ [i.e. peace be upon you], because [Allaah] states in the Aayah [i.e. 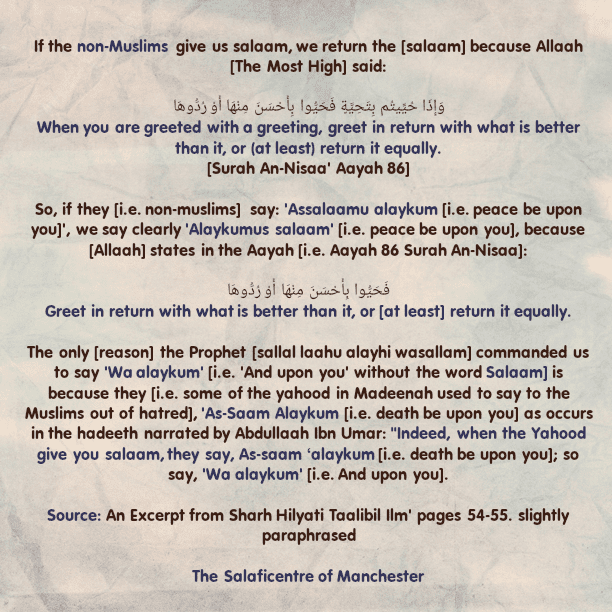 Aayah 86 Surah An-Nisaa]: Greet in return with what is better than it, or [at least] return it equally. The only [reason] the Prophet [sallal laahu alayhi wasallam] commanded us to say ‘Wa alaykum’ [i.e. ‘And upon you’ without the word Salaam] is because they [i.e. some of the yahood in Madeenah used to say to the Muslims out of hatred], ‘As-Saam Alaykum [i.e. death be upon you] as occurs in the hadeeth narrated by Abdullaah Ibn Umar: “Indeed, when the Yahood give you salaam, they say, As-saam ‘alaykum [i.e. death be upon you]; so say, ‘Wa alaykum’ [i.e. And upon you].